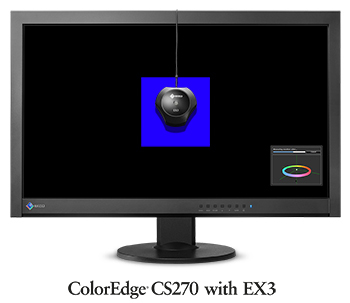 Hakusan, Japan, July 07, 2015 – EIZO Corporation (TSE: 6737) today announced the EX3 calibration sensor for use with ColorEdge CS and CX series monitors. The EX3 sensor is the successor to the EX2 and can be used with EIZO’s proprietary ColorNavigator 6 and ColorNavigator NX calibration software*. With ColorNavigator 6, preset target values for photography, print, and web design are included for individual users looking for a simple way to calibrate ColorEdge monitors. Experienced users can set their own target values for brightness, gamma, and white point, and generate an ICC profile. ColorNavigator NX is for organizations that want to centralize quality control of their monitors and covers calibration, film emulation, built-in sensor correlation, and color mode setting. For more information on ColorNavigator 6 and ColorNavigator NX, visit these pages. * ColorNavigator 6 Ver. 6.4.10 or ColorNavigator NX Ver. 1.1.4 or later required.